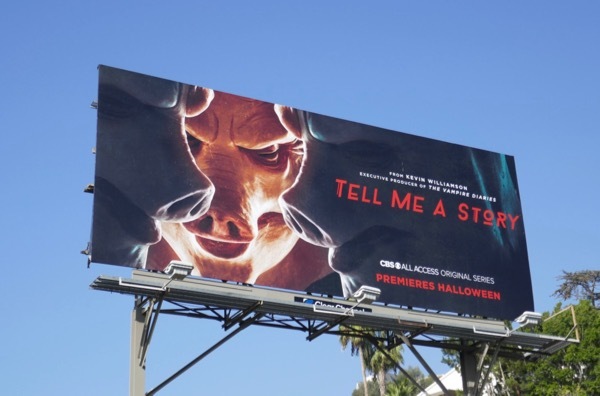 Happy Halloween and to mark the occasion, here's a disturbing visual complete with a demonic-looking human hybrid three little pigs for the new CBS All Access series, Tell Me A Story. 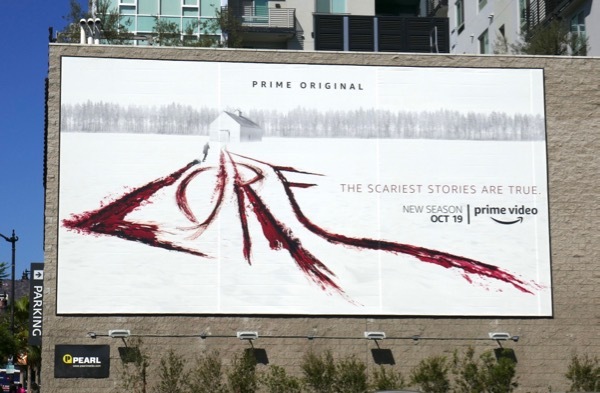 The unsettling key art is for the streaming platform's latest original series based on the Mexican psychological thriller Érase uno vez, which takes the world's most beloved fairytales and fables like The Three Little Pigs, Little Red Riding Hood and Hansel and Gretel and reimagines them into a serialized drama of love, loss, greed, revenge and murder in modern day New York City. 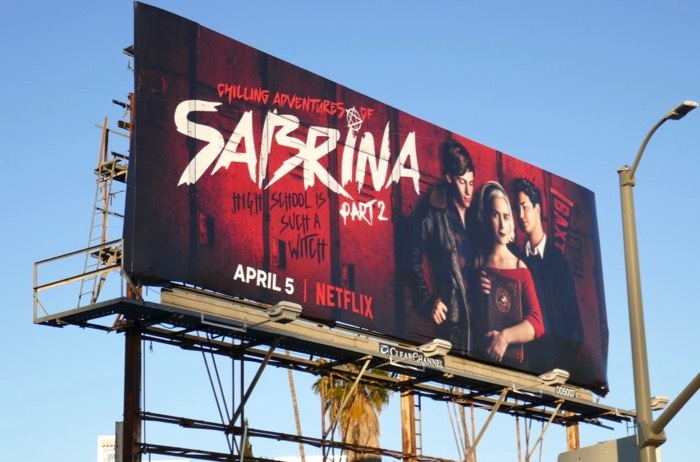 Developed for American audiences by Scream's Kevin Williamson, the show stars Kim Cattrall, Billy Magnussen, Paul Wesley, Dania Ramirez, Danielle Campbell, James Wolk and more. 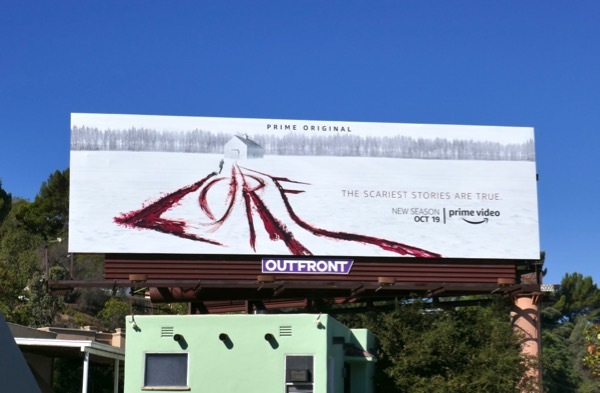 This eye-catching, giant-sized series launch billboard was photographed along Beverly Boulevard on October 18, whilst the landscape version was spied along the Sunset Strip on October 29, 2018. 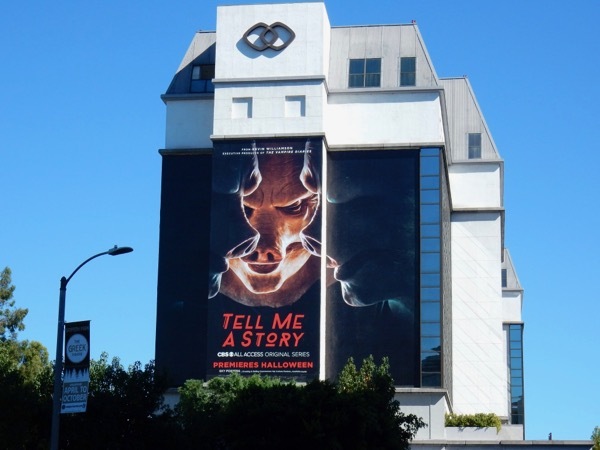 Here's wishing you all a frightful Halloween of sinister scares and spooky delights. 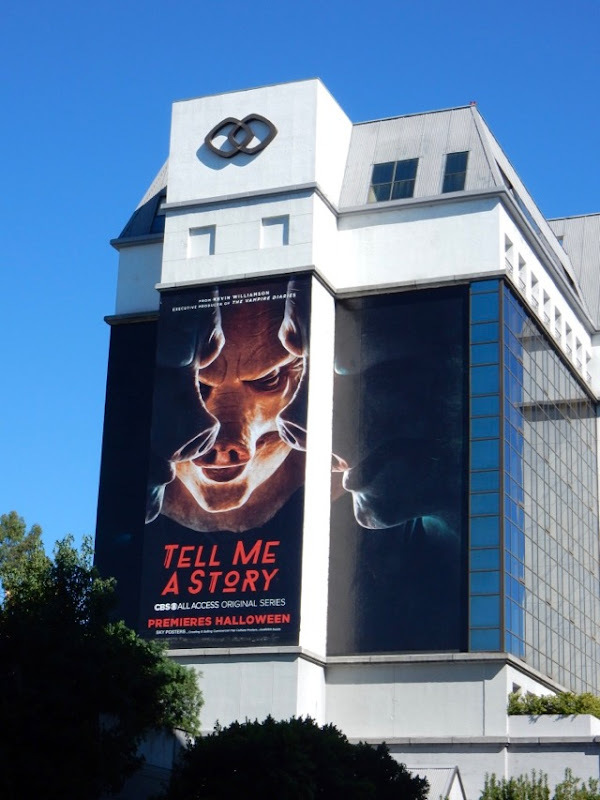 Happy haunting and don't be a pig when it come to all those candy treats. 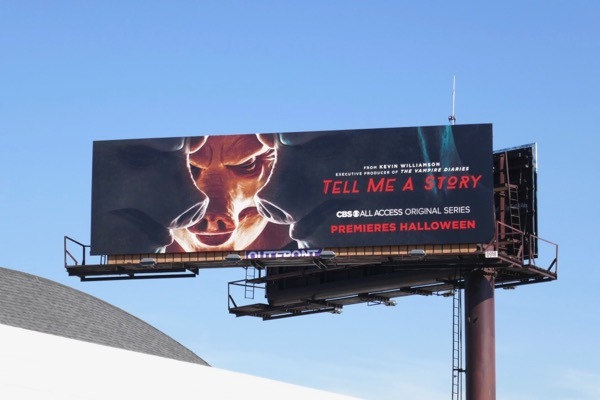 UPDATED: Here's some more creepy support for the new series spied along Pico Boulevard and Santa Monica Boulevard on November 3, 2018. 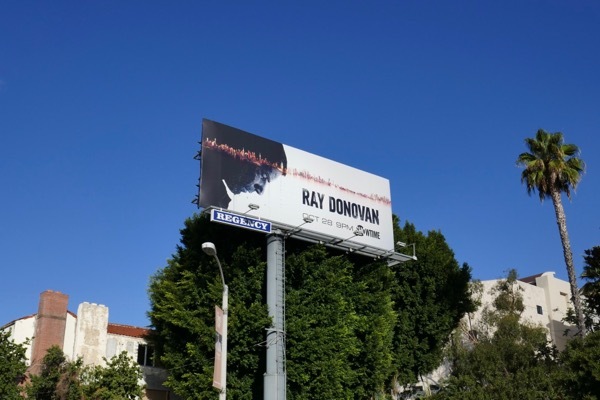 Is it wrong that Daily Billboard craves bacon every time we see these piggy ads? UPDATED: Here's also a billboard featuring the Tell Me A Story key art to promote the CBS All Access subscription streaming service. 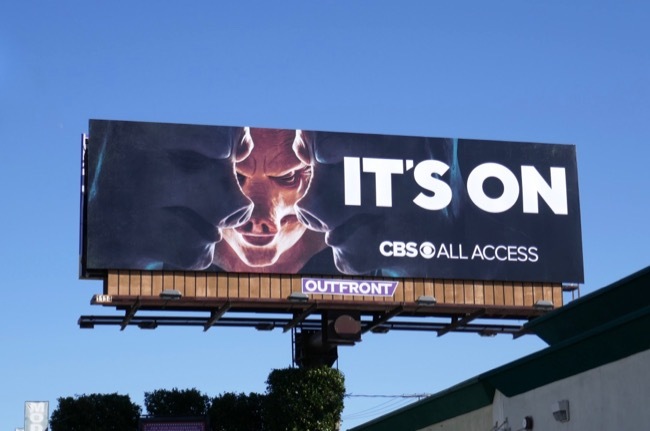 This 'It's On' billboard was spotted along Pico Boulevard on February 6, 2019. 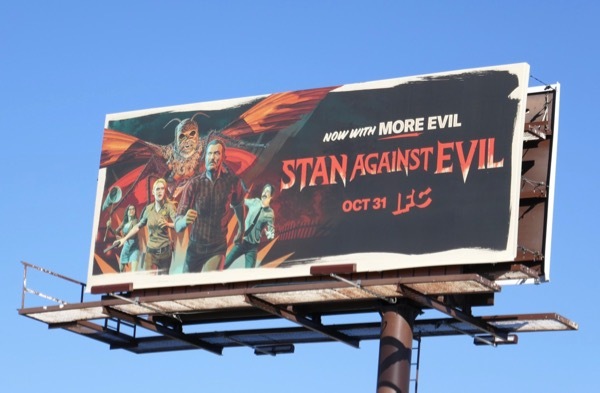 In the comedy-horror series, Stan Against Evil, a crotchety old-school, former sheriff named 'Stanley Miller' (played by John C. McGinley) must team up with his younger fresh-faced replacement, 'Evie Barrett' (Janet Varney) to fight off the supernatural forces that threaten their small New Hampshire town. 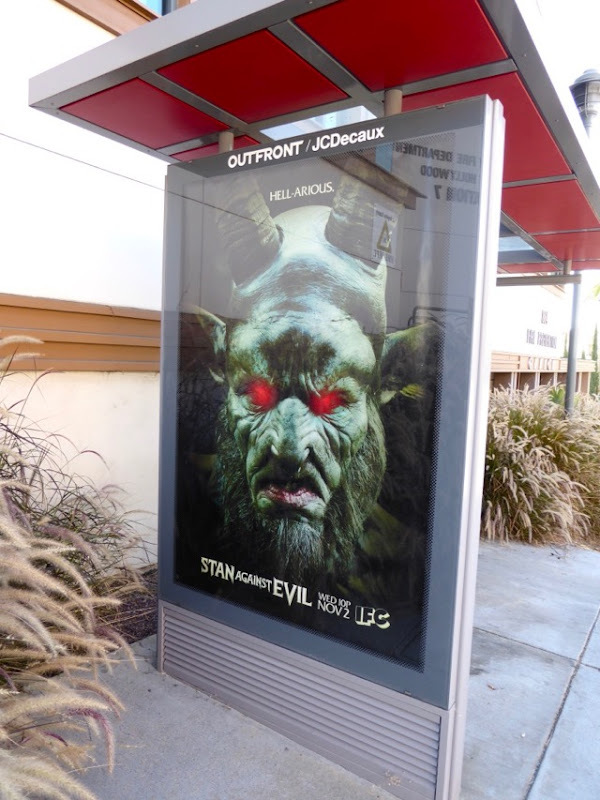 This Halloween the IFC show created by comedian Dana Gould is back for a third season of fighting demons, witches and evil spirits, and by the looks of things a strange Mothman creature too. 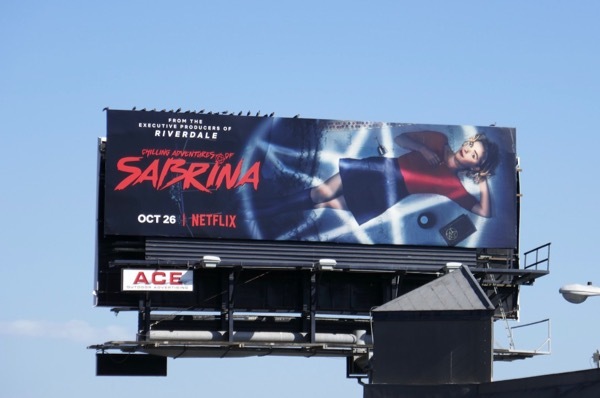 The season one billboards and posters were snapped along San Vicente Boulevard, Fairfax Avenue and Olympic Boulevard from October 18 to October 20, 2016. 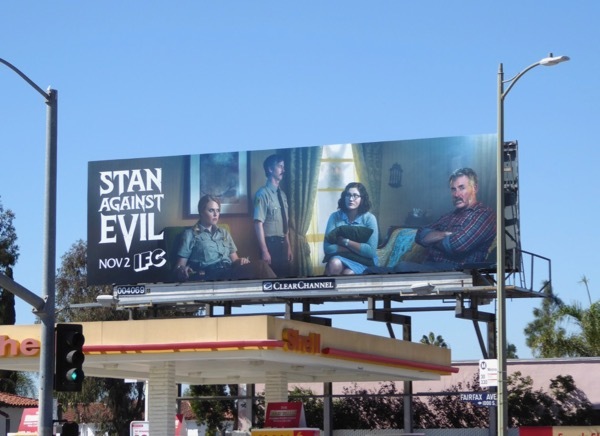 Meanwhile the season three billboards were spotted at the corner of San Vicente Boulevard and the Sunset Strip, Highland Avenue and Melrose Avenue from October 11 to October 16, 2018. 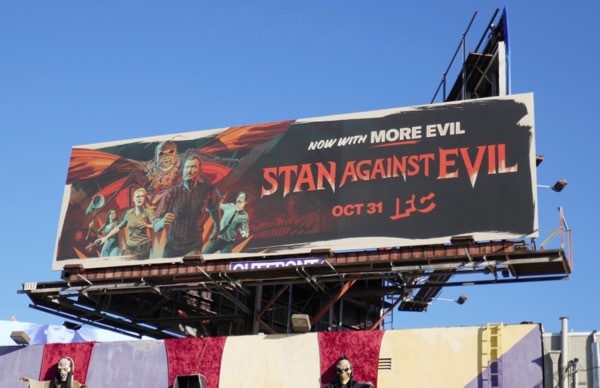 On this eve of All Hallows' Eve, if you still need help getting in the spooky spirit be sure to also check out all these Halloween and horror-themed billboards. 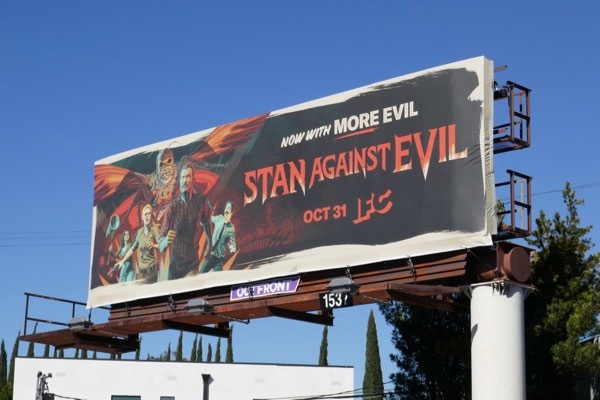 There's always a reason to stand against evil, but especially when your town is built on the site of a massive witch-burning. 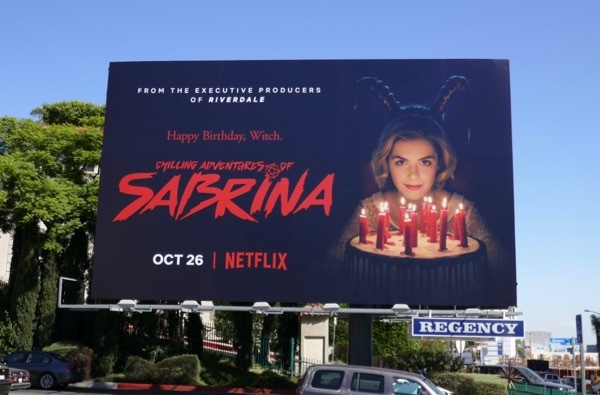 It seems there's never a dull moment for the residents of Williard's Mill, and we're sure Halloween will be no exception. 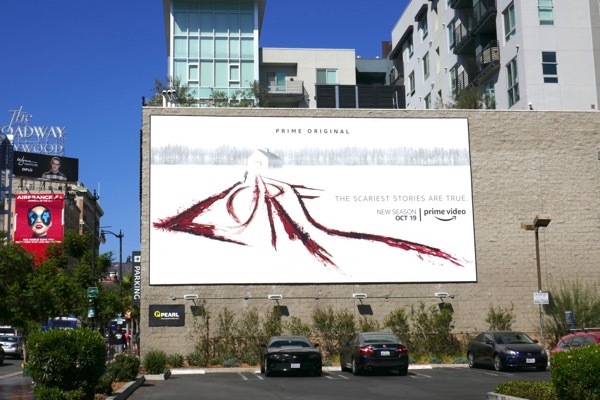 To help get you in the Halloween spirit this week, here's some creepy billboards for the first two seasons of Amazon Prime's original series Lore. 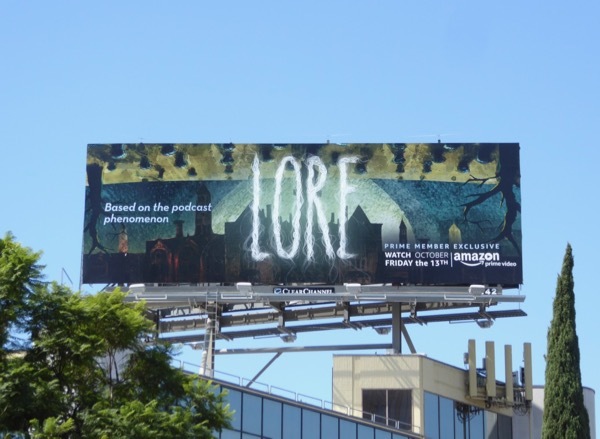 Based on the popular podcast by Aaron Mahnke, the anthology series explores real-life horror stories from history and mythology that spawned our darkest nightmares. 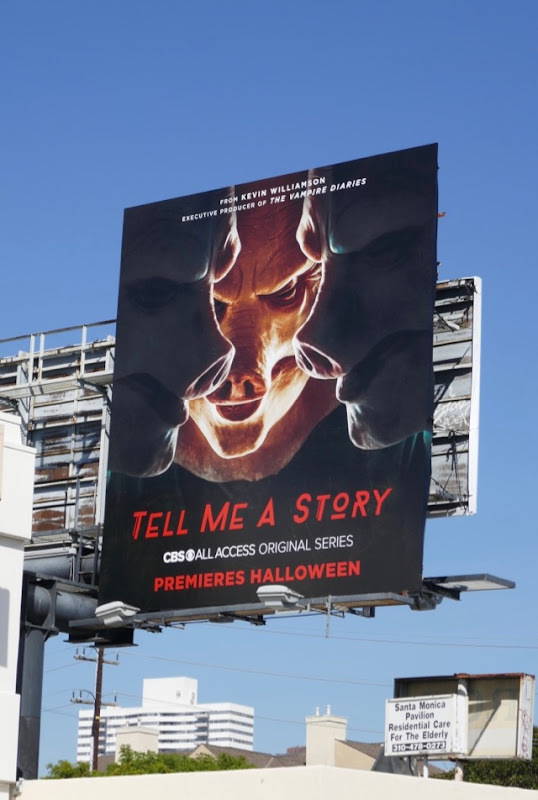 Vampires, werewolves, ghosts, witches, demons and devils, the series now in its second season explores the origins of these horror legends and more that people have spread from mouth-to-mouth through the centuries. 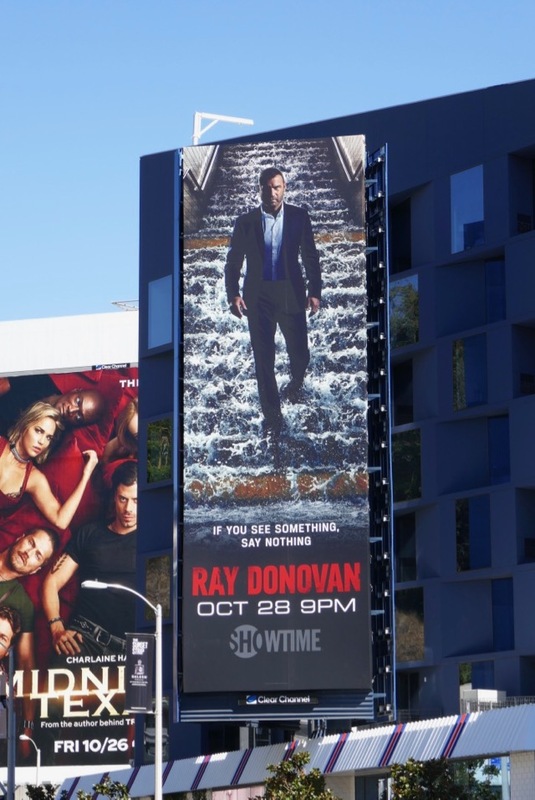 These season one billboards were snapped along San Vicente Boulevard, La Brea Avenue, Highland Avenue and the Sunset Strip from October 4 to October 25, 2017. 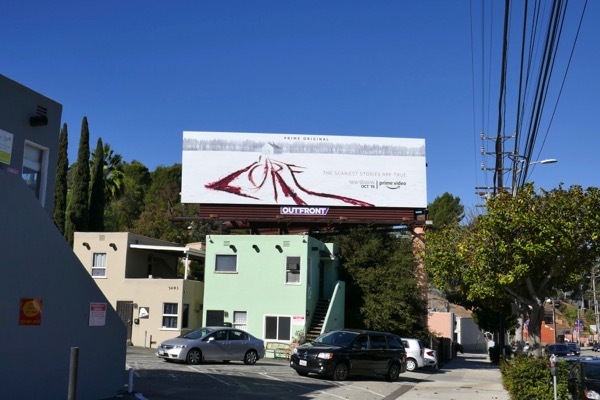 Meanwhile the sophomore season billboards with the title written in bold in the snow were photographed along Hollywood's Vine Street and Cahuenga Boulevard from on October 11 to October 15, 2018. 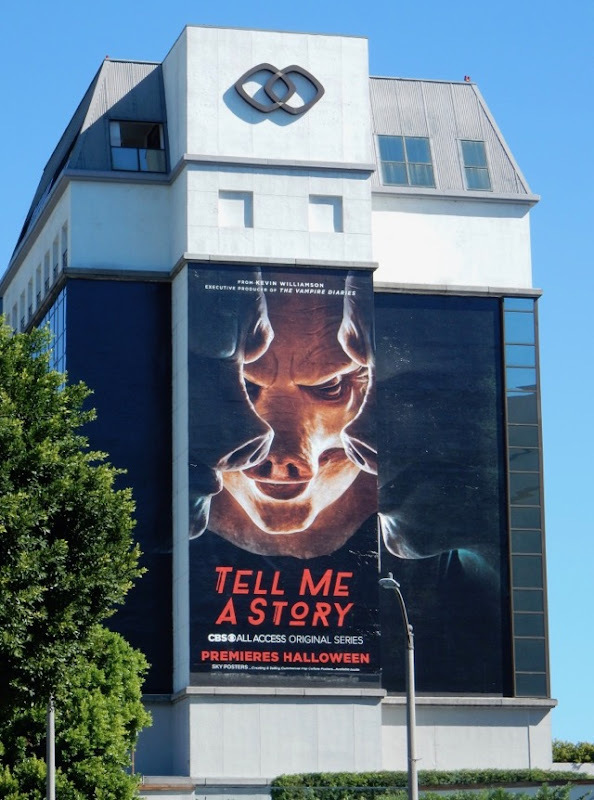 Plus for more outdoor ads to get you in the spooky mood, be sure to also check out all these other Halloween and horror billboards haunting the city skyline in recent years. Whatever your Halloween traditions that have been passed down through the ages, here's hoping that you have a bloody good time this week. 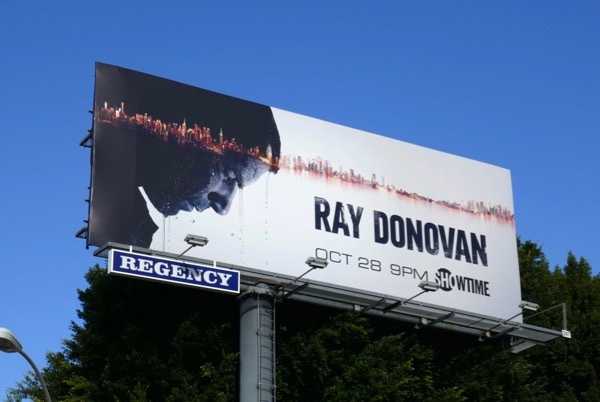 In the sixth season of his show, Liev Schreiber's Ray Donovan is heading East to rebuild his life both professionally and personally in New York City. 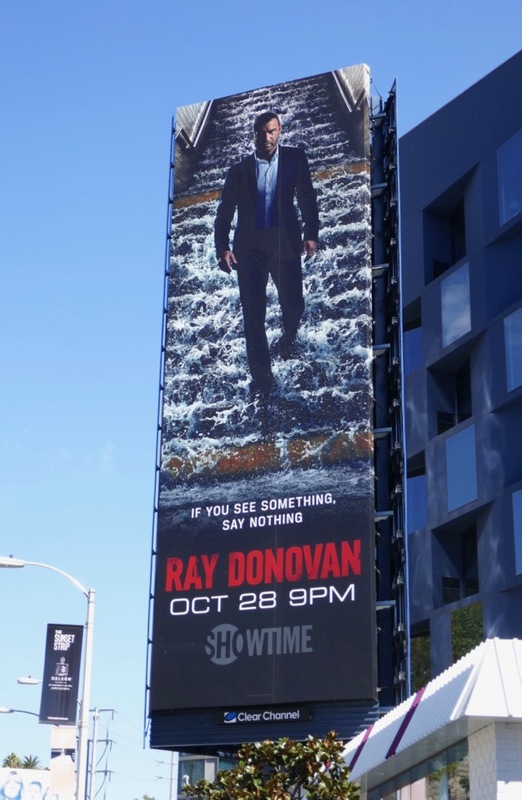 After being rescued from his plunge into the East River by a cop, he's introduced into the brotherhood and corruption of the Staten Island Police Department, whilst Susan Sarandon's media mogul 'Sam Winslow' wants his help fixing some issues with her chosen New York City mayoral candidate 'Anita Novak' (played by Lola Glaudini). 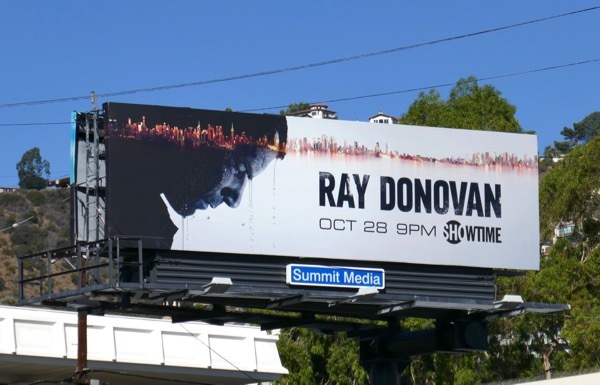 These billboards certainly suggest Ray has a messiah complex this season with one ad creative with an illuminated cityscape like a crown of thorns and instead of dripping blood, it's water, and the other billboard with the fixer seemingly walking on water (or at least down a flooded subway staircase). 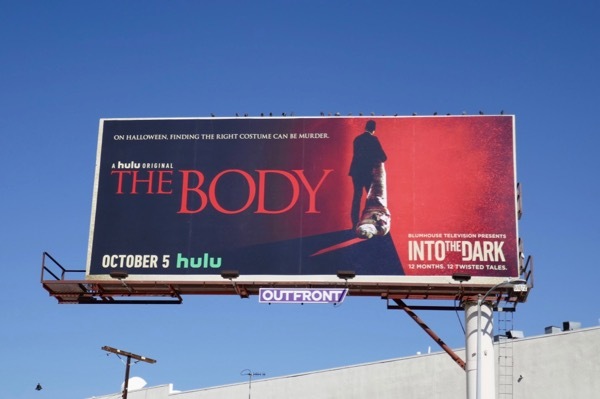 These season six billboards were photographed in multiple locations along Sunset Boulevard and above La Brea Avenue from October 11 to October 26, 2018. 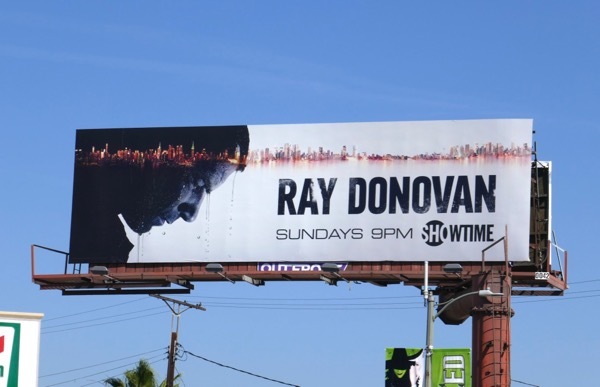 Fans of the Showtime drama can also check out all these previous season promo billboards for Ray Donovan from June 2013 to date. 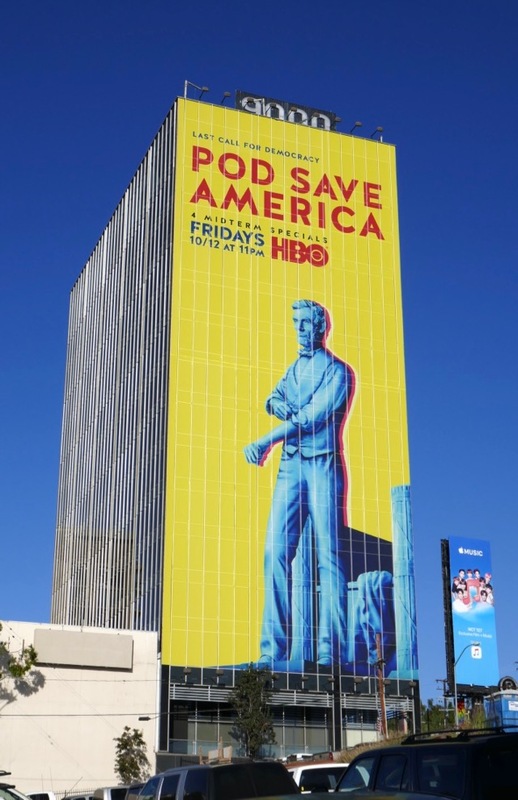 Let's see if the move from the show's usual Los Angeles setting to the East Coast can keep the drama as fresh and invigorating in its sixth season as a dip in the East River. 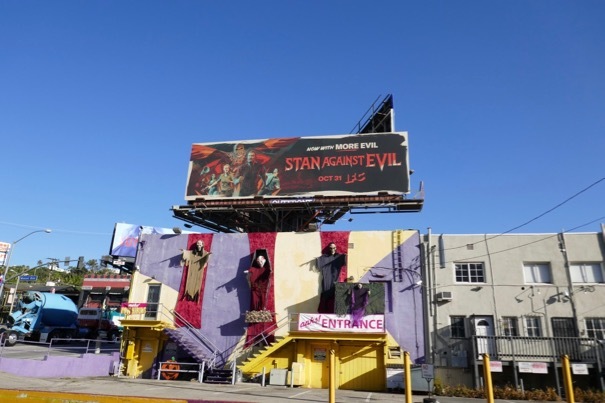 What are dressing up as this Halloween? 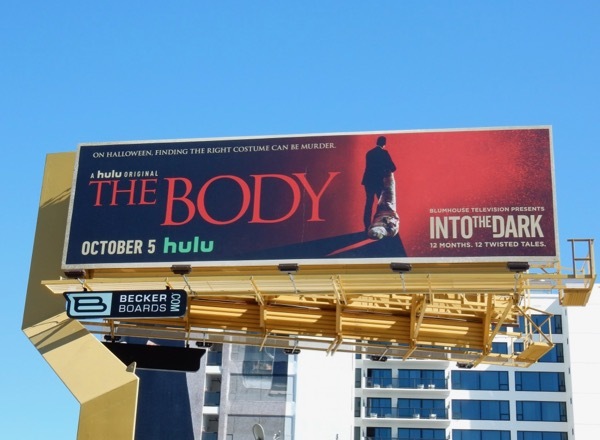 Sometimes finding the right costume can be murder, in some instances, quite literally. 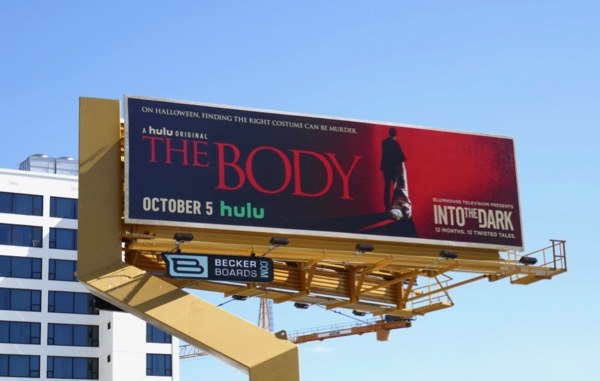 Streaming platform Hulu is trying to get subscribers in the spooky Halloween spirit with its new horror anthology series from Blumhouse Productions, Into the Dark. 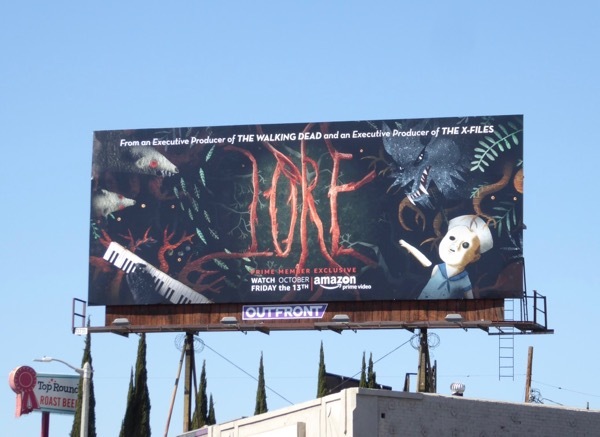 Each of the twelve tales of horror is inspired by a seasonal holiday during the month it is released and the first installment, The Body, takes place at Halloween in L.A. when a sophisticated hitman carries out his deadly work, but he's hindered when partygoers mistake the body he's transporting as part of a cool costume. 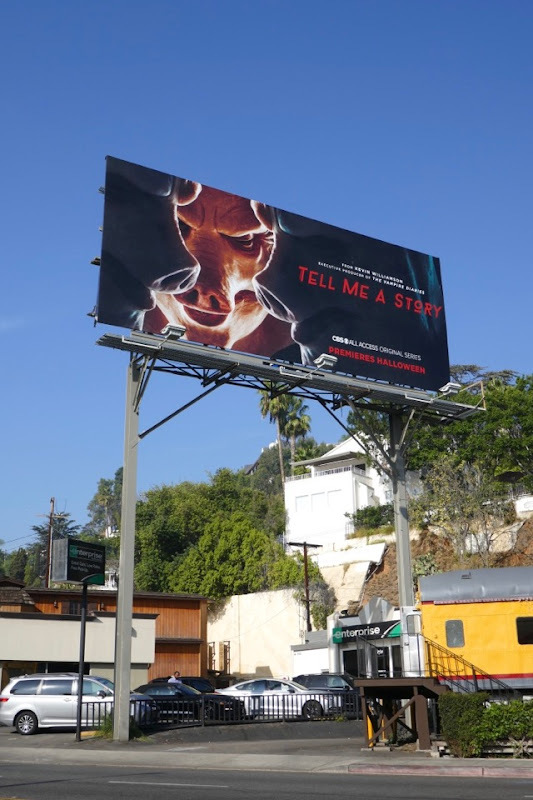 These grisly billboards were snapped along the Sunset Strip, La Cienega Boulevard and Santa Monica Boulevard from October 11 to October 22, 2018. 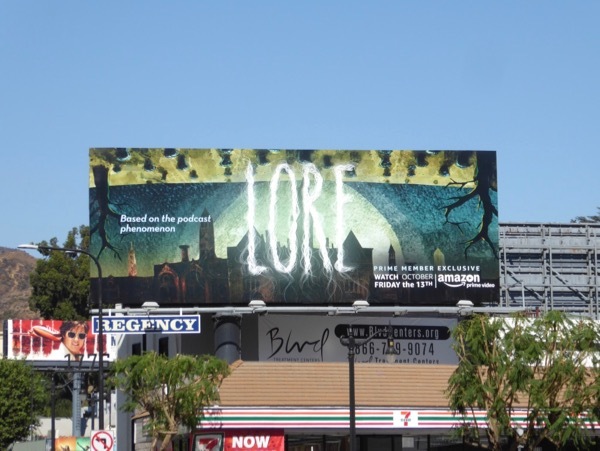 Do you like to be scared and enjoy things that go bump in the middle of the night? 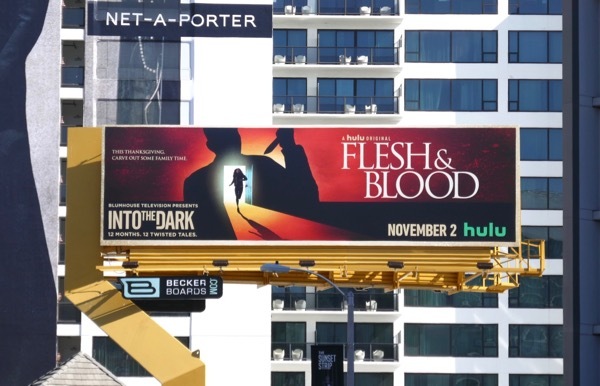 More importantly, will you be venturing Into the Dark with Hulu for a monthly horror fix in the year ahead. 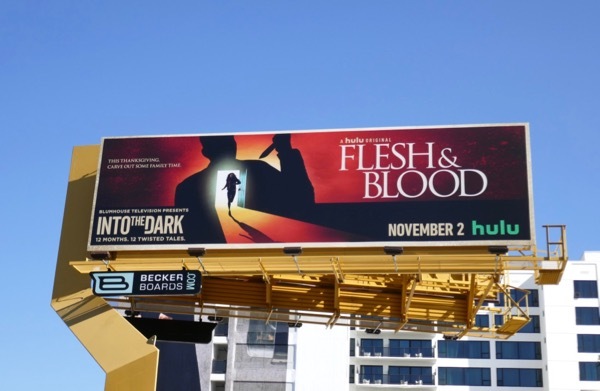 UPDATED: Here's the next installment in the horror anthology just in time for the run up to Thanksgiving, Flesh & Blood. 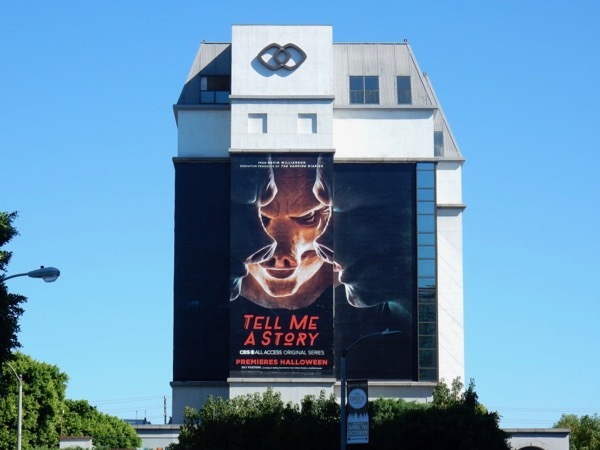 This tale is about a woman who becomes afraid to leave her home after the death of her mother and feels like her life is in danger, but she can't leave. 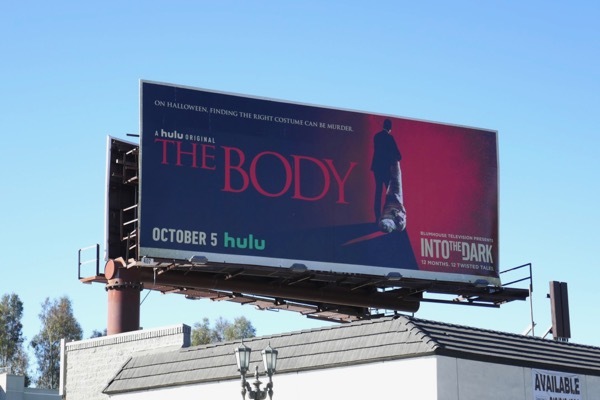 This striking Into the Dark billboard was snapped above the Sunset Strip on October 31, 2018. 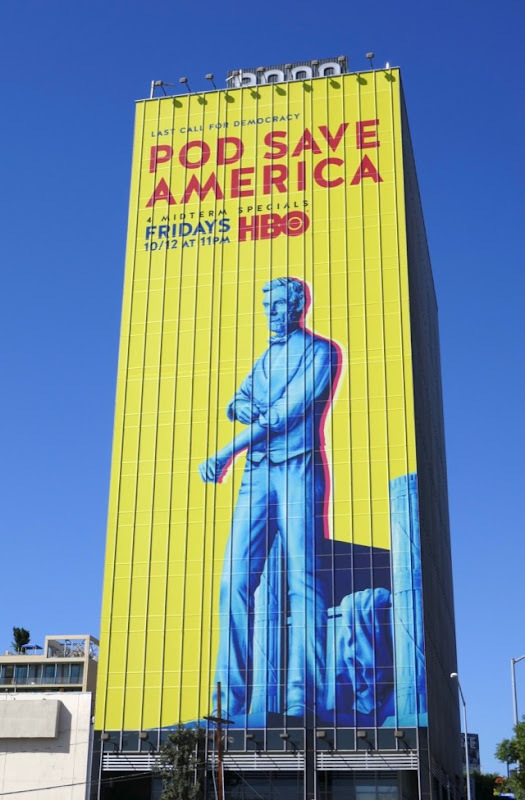 Come on Abraham Lincoln it's time to roll up those sleeves and get to work saving democracy in America before it's too late. 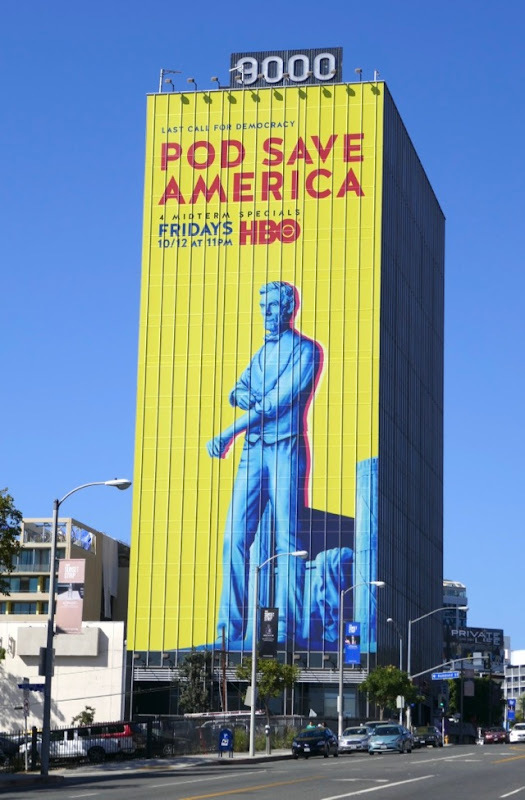 Forget God (remember that supposed separation between church and state), it's time for decent citizens to fight for their rights to live in a free, fair and equal society in this United States. With the midterm elections looming this November, the liberal political podcast, Pod Save America, is on hand with a series of televised specials on HBO to give some no-nonsense commentary with the help of four former staffers of President Obama, joined by journalists, comedians and activists for some progressive conversations. 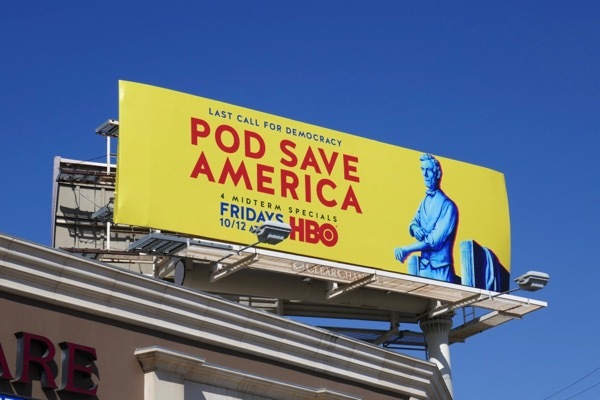 These vibrant Pod Save America (love the play on words) billboards were spotted along the Sunset Strip and Melrose Avenue on October 11, 2018, and this is one giant-sized billboard you really see from a great distance. 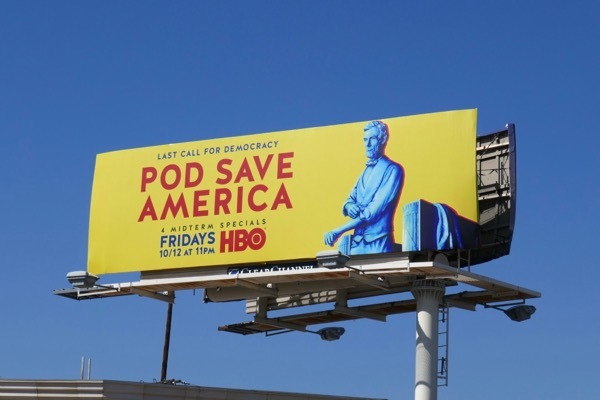 For more parodies using former presidents and U.S. landmarks and iconography be sure to also check out all these Veep billboards and these Drunk History billboards. 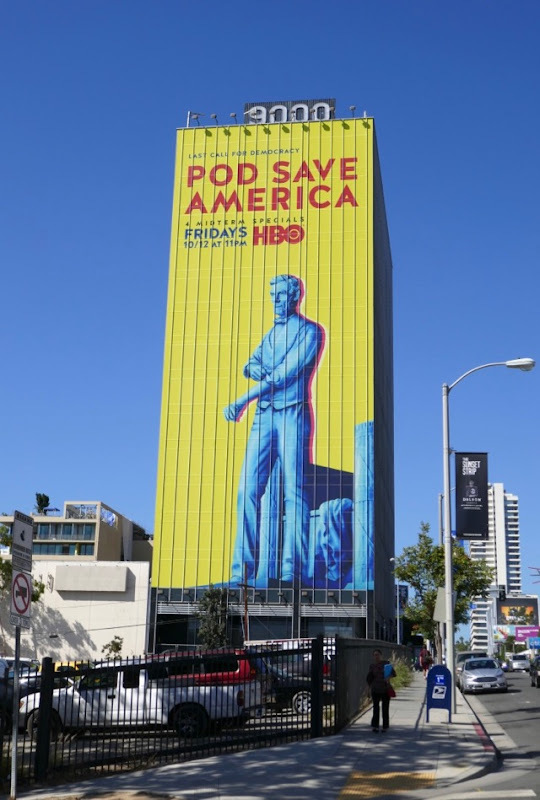 Republicans seem to be happy to let the U.S. slide into fascism and become a dictatorship as long as they get a tax break, but some people are offended by locking children up in cages, trying to strip healthcare from millions, denying women and LGBT people equal rights, and a thuggish President cosying up with white supremacists, brutal dictators and foreign governments over America's own interests. 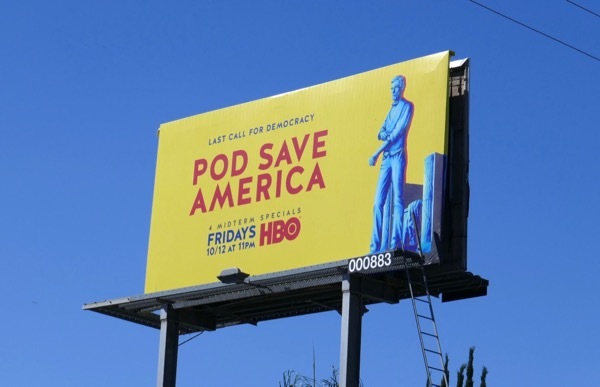 Vote like your life depends on it, because this time it really does. 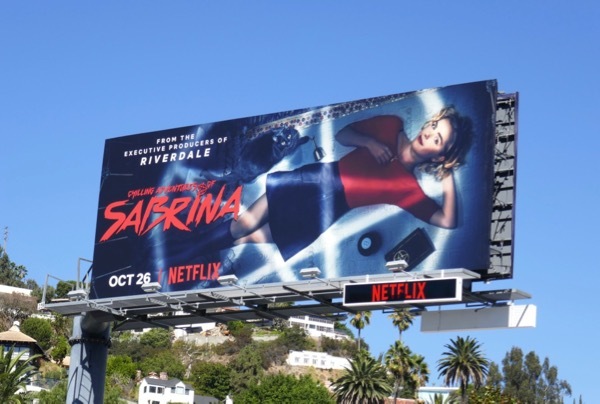 Charmed isn't the only spellbinding show to receive a remake this fall TV season as Sabrina the Teenage Witch gets a Netflix makeover from the executive producers of Riverdale with the Chilling Adventures of Sabrina. 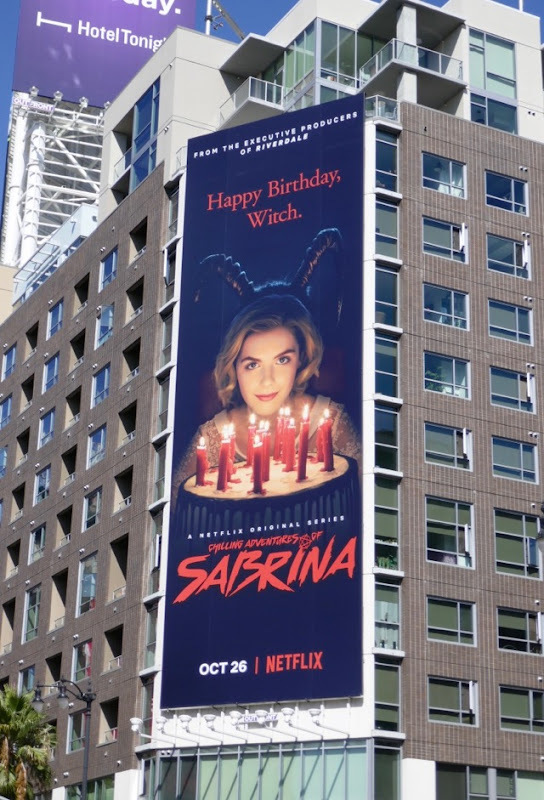 The original sitcom, based on the Archie Comics character created by George Gladir and Dan DeCarlo, starred Melissa Joan Hart as 'Sabrina Spellman' and ran from 1996 to 2003 for seven bewitching seasons. 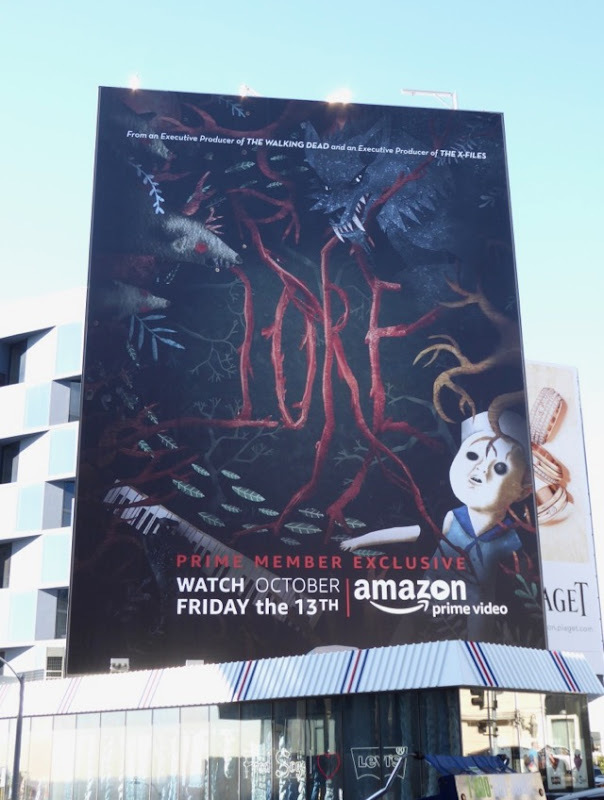 This new series from the streaming giant is based on the darker Archie Horror comic book which started in 2014 and was written by Roberto Aguirre-Sacasa with art by Robert Hack. 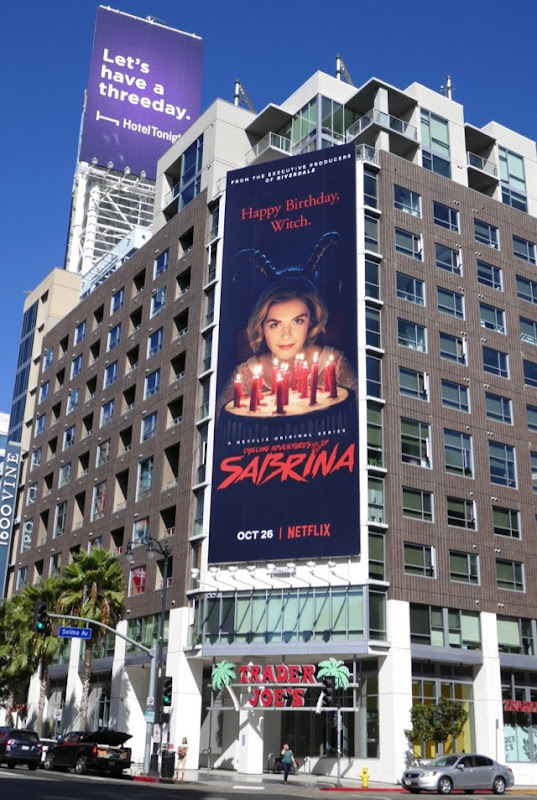 Initially designed as a companion series to The CW's Riverdale, the show stars Mad Men's Kiernan Shipka as the half-mortal, half-witch teenager. 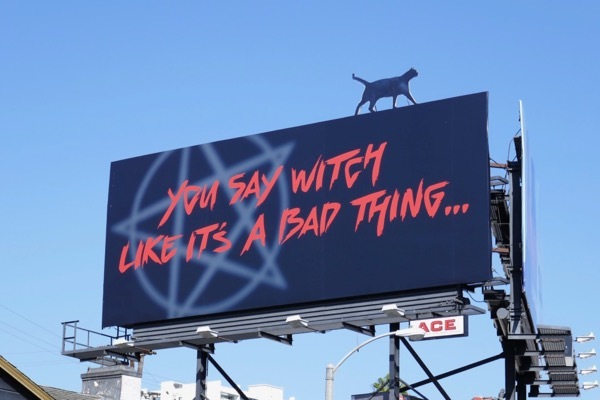 On her sixteenth birthday she must chose between the worlds of her human friends and her witch family, no doubt with the help of her familiar cat 'Salem'. 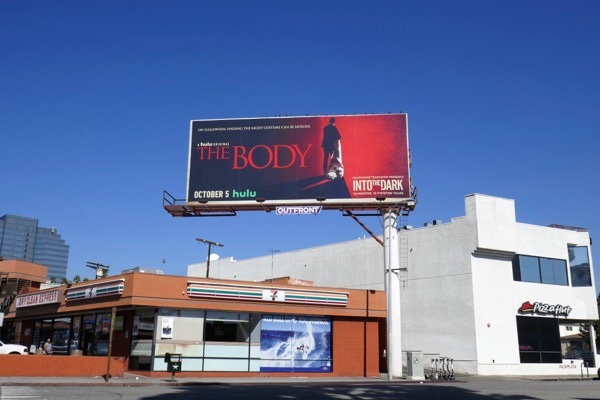 These series launch billboards were photographed along the Sunset Strip, Melrose Avenue, Vine Street and Highland Avenue from October 11 to October 20, 2018. 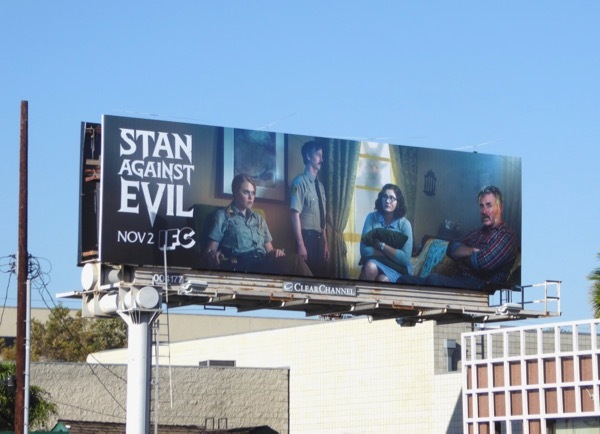 Plus fans of Kiernan Shipka can also enjoy this Mad Men 2014 Emmy billboard and these Flowers in the Attic billboards. 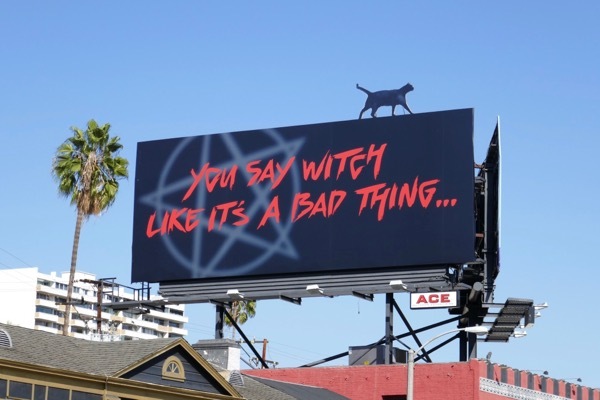 For more witchy outdoor ads be sure to also check out these Charmed billboards, these billboards for The Secret Circle, these Salem billboards and these American Horror Story: Coven billboards. 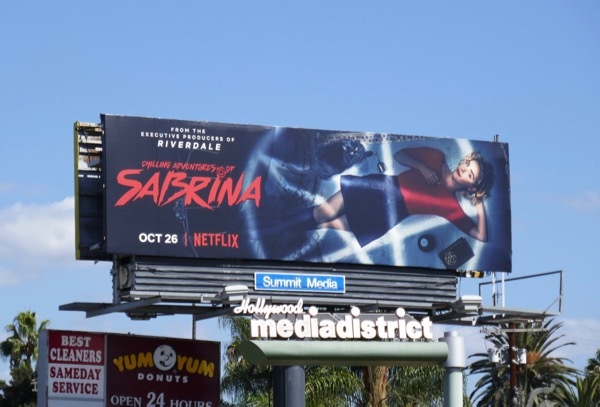 Witches have such a bad reputation, so let's see if Sabrina can change all that when she makes her chilling debut just in time for Halloween. 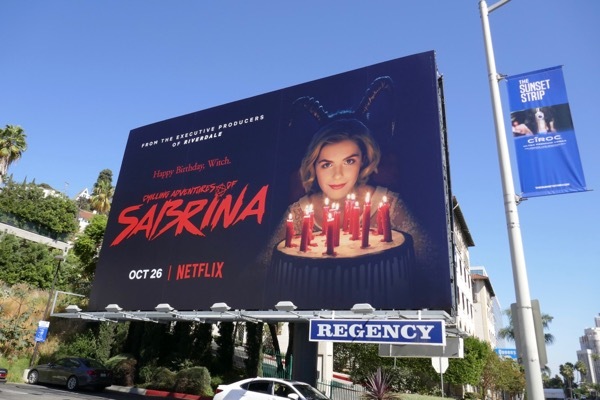 UPDATED: Here's also two examples of the ad creative for the second part of Sabrina's first season episodes. 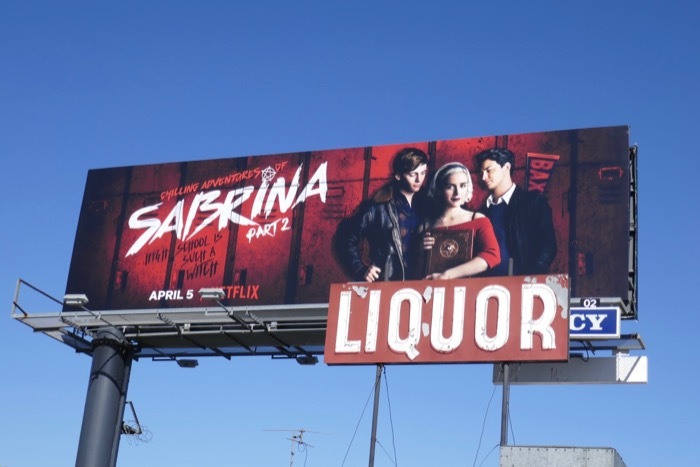 These high school locker billboards were spotted along Sunset Boulevard and Cahuenga Boulevard from March 28 to March 30, 2019.